Admission is Free. For more information, call (818) 243-4112. 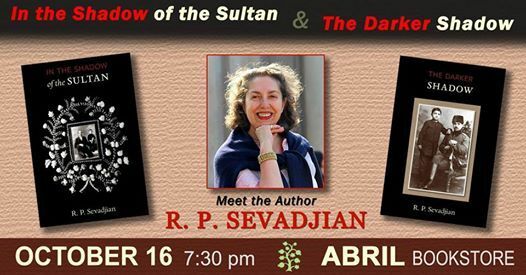 In the Shadow of the Sultan is an adventure story of survival and self-discovery. It provides an insight into the way of life of Armenians in the Ottoman Empire at the close of the nineteenth century. The story is set during the summer of 1896, at the height of the Hamidian Massacres in Ottoman Turkey. It follows an Armenian boy in his early early teens who leaves his home and journeys on his own but accompanied by his beloved dog, Kaylo, and his faithful mule,Vartoug, two hundred miles to his grandmother’s town. On his journey he forms a better understanding of the treatment of Armenians in the Ottoman Empire.The maturing of the boy is shown through his actions upon meeting various people on his journey; kind people, bad people, helpless people. 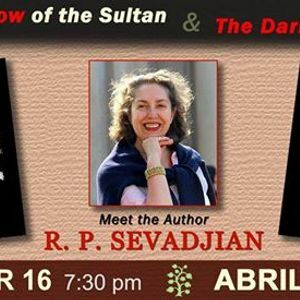 The Darker Shadow is the sequel to In the Shadow of the Sultan. It is written for younger readers who do not know much of the recent history of the Armenian people. This coming of age novel tells the story of teenage twins, Bedros and Dzovinar, who live in Aintab with their uncle. The novel traces the events of Autumn 1914 to Summer 1915—the beginning of the systematic annihilation of the Armenian race in the Ottoman Empire. It tells the story of important episodes such as the Battle of Sarikamish, The Fall of Zeitoun, The Defence of Van among others. R. P. SEVANDJIAN was born and raised in Africa. She now lives in the UK and is currently researching the Armenians of Ethiopia and the work of her father, B. A. Sevadjian.